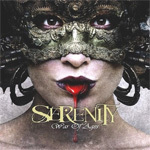 While Serenity�s newest album came out at the end of April or May depending on your location, I believe it�s one of the best melodic and symphonic metal works of 2013. I�ve been a fan of this Austrian band since their debut, Worlds Untold, Dreams Unlived. Every work since they�ve added new symphonic elements, different wrinkles to their music like guest death metal/growling on their Fallen Sanctuary disc to guest vocals and spoken interludes on Death and Legacy. Has Serenity sound changed? No! Is this a repeat of a previous CD? No! Should you buy it? That would be an astounding, Yes! Every song tells a story about a different famous character from the annals of history. From Beethoven (Symphony of the Quiet) to Henry the VIII (Legacy of Tudors) each song carries a bombastic, melodic, and symphonic sound that really draws you in. The disc starts with Wings of Madness (see below), with haunting nylon string guitar and female vocals which lead you into symphonic and complex. This is something fans of the band Kamelot or Sonata Arctica would find familiar. It's also a good time to mention the new addition to the band: Clementine Delauney, the band's new female vocalist. When her parts come in, a whole new dynamic part of Serenity's sound is amplified. She rests in that alto to mezzo-soprano range without being overly operatic or sounding forced. Her solo parts as well as her duets with Georg Neuhauser blend naturally, with neither taking a stronger presence over the other. They sound like they are one voice, with the rest of the band backing them up. Thomas Buchberger's amazing fretwork is definitely a highlight on this work, from the shredding solo of The Art of War to the beauty and simplicity that is For Freedom's Sake. The other members, Andrea Schipflinger (d), Fabio D'Amore (b) and keyboards from Mario Hirzinger, who left the band in 2012, create a solid backdrop to the sound of Serenity. As all instruments get their proper mix and attention, where dynamics are just as important as solos, these are the qualities which make Serenity different then their contemporaries. If there is one gripe I have with War of Ages, it's Neuhauser's mispronunciation of English words. Nevertheless, this is likely nitpicking since English is not his first language, and should not detract from the album as a whole. The highlights of this disc are across all songs, from the dynamics of Wings of Madness to the choir of The Art of War to the beauty of For Freedom's Sake. Ms. Delauney's voice is a highlight, as important in both lead and background vocals. (In the aforementioned song, she sounds similar to Sharon Del Adel of Within Temptation). Every song is true to what makes this band who they are, and also giving each song their own Identity. From the classical piano intro of Symphony of the Quiet, to the melodic-80's era inspired opening solo of Tanennberg, Serenity finds a way to lure you into each song. Two bonus tracks came with my copy, a beautiful new version of their song Fairytales from the Fallen Sanctuary and the Queen ballad, Love Of My Life. This is their best work, the masterpiece of their career so far, and I can't stop listening to it! It is bombastic, symphonic, epic, and a 100% melodic masterpiece! Easily recommended to those who love symphonic power metal. Bombastic, Symphonic, Epic, and a 100% Melodic Masterpiece!